Even though Valentine's Day might be almost over, a recent video shows a nerdy recipe perfect for the occasion - or any occasion, really. Over the weekend, Food Network shared a video showing how to make a Death Star pie. The Star Wars-inspired treat isn't that different from a normal pie, aside from the complicated etching of the classic space station's schematics on the top of it. The video shows the top crust of the pie being put together to impressive detail, before being placed on top of a cherry pie. In celebration of Valentine's Day, the center of the Death Star is replaced by a heart. And in a nice extra touch, the baker makes a small Tie Fighter out of crust, which ultimately looks like it's flying around the Death Star. The idea is courtesy of the Youtube channel and blog Pies Are Awesome, which promises to 'reclaim pies for geeks.' Their channel boasts several other baking recipes inspired by Super Mario and Gambit. Even if creating this pie yourself sounds too detailed for your liking, watching it come to life is sure to make your mouth water. 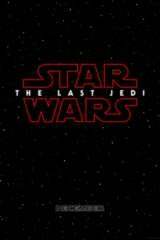 Excited for Star Wars: The Last Jedi? Click the fire icons in the box below to give it an anticipation rating and let your voice be heard! Lucasfilm Confirms Rey And Kylo Ren Have "Mysterious Connection"